Mamelodi Sundowns sealed their progression to the Caf Champions League semi-finals with a 5-1 aggregate score line, despite a 1-0 loss to Al Ahly in the quarter-final second leg in Egypt on Saturday evening. Downs came into the game, holding a massive 5-0 first leg aggregate after their thrashing of the Red Devils at the Lucas Moripe Stadium last weekend. Al Ahly were under severe pressure after their worst defeat in over 40 years, and head coach Martin Lasarte promised his side’s faithful fans they would do anything to overcome the huge deficiency. Knowing that they would need to score six unanswered goals to progress after 90 minutes, the home side came flying out of the blocks, with Dennis Onyango quick off his line to snuff out the danger just 45 seconds further on the clock. Pitso Mosimane’s charges did well to soak up all the early pressure with the Egyptians throwing everything forward, looking to unlock the well-organised Downs defence. The home side, though, came close to opening the scoring with 14 minutes gone as Amr Al Sulaya’s curling effort from the edge of the box cannoned off the woodwork. Al Ahly kept pushing forward, and Walid Azarou forced Onyango into a stunning save after smashing his half-volley goalwards in the 28th minute. Onyango was proving to be in fine form as he produced another brilliant stop this time to deny Ramadan Sobhi, who must have thought his cracking strike was destined for the back of the net 11 minutes before the break. Despite being pegged back for the majority of the first half, Sundowns were still firmly in control of the tie thanks to their big aggregate lead. Lasarte’s men came out firing in the second half as Onyango again made another great save before Junior Ajayi tapped home the rebound, but the goal was ruled out as the linesman raised his flag for off-sides with 47 minutes gone. The Red Devils continued to press forward and pulled a goal back in the 68th minute as Walid Azaro headed home a powerful cross to take the lead on the night and bring the aggregate score to 5-1. 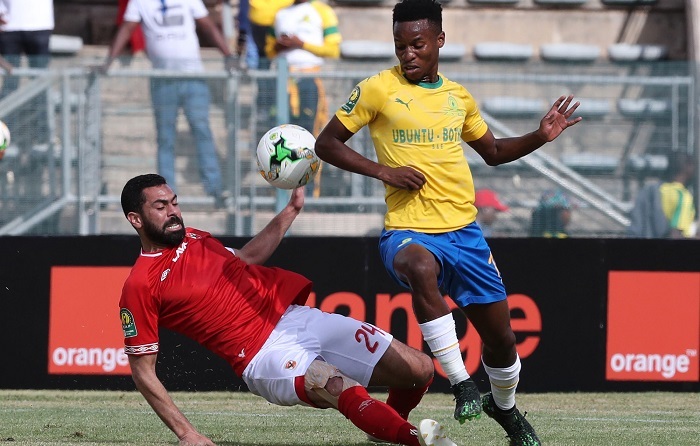 Sundowns were content to sit back and see out the game from then on, while Al Ahly continued to look to add a respectability to the aggregate score line. Masadawana stood firm, though, and progressed to the semi-finals of the Caf Champions League with a massive 5-1 aggregate victory.